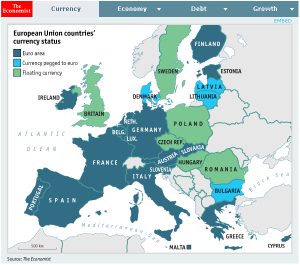 The interactive graphic above (updated November 10th 2011) illustrates the depth of the problems that the European economy faces. The euro-zone crisis reached a critical stage when Italy joined the seven per-cent club, the group of euro-zone countries whose borrowing costs (as measured by ten-year bond yields) have gone above 7% and stayed there. It public debts are close to 120% of GDP. Only Greece has a greater burden. Ireland’s is lower but it has a large budget deficit so is adding to its debt at a rapid pace. So is Britain but it has benefited from being non-euro haven and can still borrow very cheaply.